Gene Simmons probably won’t be checking out “Barbershop: The Next Cut” this weekend. 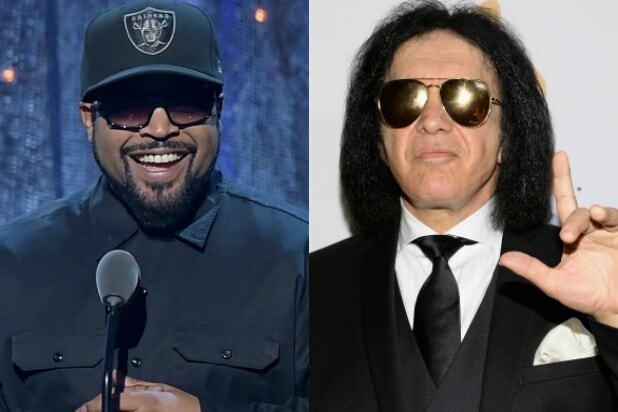 The Kiss bassist took exception to gangsta rap group N.W.A.’s inclusion in the Rock and Roll Hall of Fame, a building whose name Simmons clearly takes quite literally. Ice Cube, arguably the biggest crossover star of the infamous crew (sorry, Dr. Dre), isn’t feeling the aging rock star’s criticism. “We invent it. Y’all reprint it,” Cube tweeted, citing Chuck Berry, Little Richard and Chubby Checker. Well, technically he invoked “Chubby Checkers,” but, whatever. And at their recent Rock and Roll Hall of Fame moment, N.W.A. members Cube and MC Ren addressed Simmons directly and also the idea of including groups from a different musical genre. The short versions: hip-hop is forever, and N.W.A. is definitely rock and roll — in spirit. Below are the tweets — let us know whose side you’re on in the comments section. @genesimmons Who stole the soul? Chuck Berry, Little Richard and Chubby Checkers help invent Rock 'n' Roll. We invent it. Y'all reprint it. 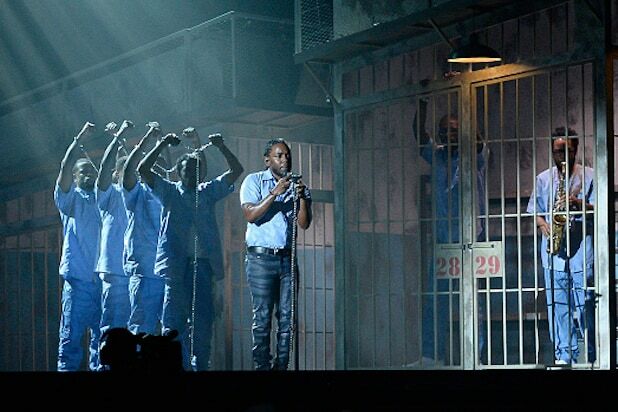 After LL Cool J promised his performance would be "very controversial" Kendrick Lamar walked out as part of a chain gang to perform "The Blacker The Berry," surrounded by flames, dancers, and prison cells. It was the most political and powerful moment of the night. John Legend had the audience swooning as he kicked off the star-studded tribute to Lionel Richie with "Easy" by Richie's group The Commodores. Demi Lovato then took the stage with a fantastic rendition of Richie's "Hello;" next was Luke Bryan's turn with "Penny Lover." Meghan Trainor shined with "You Are the Sun," Tyrese Gibson rocked "Brick House" like nobody's business, and finally, a visibly touched Richie took the stage to sing "All Night Long" and bring down the house. Little Big Town reminds us that country music is all about talent and class. Surrounded by string instruments on stage, the group sang their hit "Girl Crush" and there was nothing little about this performance. The singer delivered a show-stopping tribute to music legend David Bowie, ripping through a string of songs by the legend, who died in January at age 69. The performance began with the image of Gaga’s face painted with Bowie’s iconic Ziggy Stardust makeup . The pair complimented each other perfectly in a mashup of Day's "Rise Up and Goulding's "Love Me Like You Do." The vocals soared way above the formidable theatrics. It was a big night for The Weeknd, whose real name is Abel Makkonen Tesfaye. The singer, who is known for extreme stage fright, managed to pull off a strong performance with a mashup of his songs "In the Night" and "Can't Feel My Face." 7. Chris Stapleton and Gary Clark Jr. These two brought a raw blues sound to the Grammys stage with a tribute to the late great BB King. The duo was joined onstage by Bonnie Raitt, who introduced the tribute to the legendary guitarist who passed away on May 14, 2015. Miguel paid tribute to the late Michael Jackson, performing one of the King of Pop's most popular tunes, "She's Out Of My Life." The cast of "Hamilton" performed “Alexander Hamilton." The performance took place at the Richards Rodgers Theatre in New York City, and broadcast in the Staples Center via satellite. The performance rocked but it was Lin-Manuel Miranda's rap-themed acceptance speech for winning for Best Musical Theater Album that had everyone talking. The Eagles' Don Henley, Bernie Leadon, guitarist Joe Walsh, bassist Tim Schmit and Jackson Browne had the house cheering with their performance of "Take It Easy" in honor of Glenn Frey, who died last month. We expected more from Taylor Swift. The pop singer kicked off the 58th Grammy Awards with a performance of "Out of the Woods." She pulled off the glittering jumpsuit, but as any "Swiftie" will tell you, she can do more ... a lot more. We adore Adele. She can do no wrong by us, but this wasn't her best night. There seemed to be too much reverb during her "All I Ask" performance. Still, if you like big powerful ballads, this performance was for you. Pitbull closed out the awards ceremony with an upbeat, rhythm-happy performance. Of course, he had ample assistance in the form of "Blurred Lines" singer Robin Thicke, drummer Travis Barker ... and "Modern Family" star Sofia Vergara, dressed as a taxi. Hail, yeah. Beliebers aren't going to like this but Justin Bieber, Skrillex and Diplo turned in a suitable but ultimately forgettable performance of their Grammy-winning song "Where Are U Now?" The group also performed the new Bieber song "Love Yourself" off of his album "Purpose." Lead singer and guitarist Brittany Howard put on a powerfully aching performance of the group's “Don’t Wanna Fight.” The band had another good moment when it took home its first Grammy ever for best rock song and best rock performance. The singers got to show their stuff as they performed a medley which included Bay's "Let It Go" and Kelly's "Hollow." This pair's performance had the looks, but the sound wasn't there. Underwood and Hunt sang a duet of his "Take Your Time" and her "Heartbeat," but even though people seemed to like their performance, there were some serious sound issues. They performed a touching tribute to Earth, Wind & Fire's Maurice White, who died earlier this month. Wonder and the a cappella group performed "That's the Way of the World." We have any complaints, but they didn't blow our minds. The 12-year-old pianist protege showed off his mad skills in a short but uber sweet performance. Alexander, who got a standing ovation, is the sixth youngest person to get a Grammy nod. A supergroup featuring Alice Cooper, Johnny Depp and Duff McKagan, tore through a powerful if somewhat ramshackle tribute to Motorhead bassist Lemmy Kilmister, who died Dec. 28 at age 70. The group's tribute included Kilmister's signature song "Ace of Spades."